Early Retirement on Dividend Income, which Province is the Best in 2018? After my last financial freedom update, a few readers have asked me about dividend taxation. This article will show the advantage of dividend income for the early retiree. This post was originally written in 2016, but updated for 2018. Every year when winter strikes in Newfoundland, my wife and I always ask the same question “what would it be like to live somewhere else?”. While my wife and kids dream of enjoying a warm beach in Florida, my mind, on the other hand, wanders to jurisdictions with lower taxes and a lower cost of living. It’s unlikely that we’ll change provinces while the kids are in grade school, but it’s possible once they reach post-secondary education. Thinking ahead 10-11 years from now, both kids will be underway in their post-secondary pursuits, and our dividend portfolios should be a substantial size and more than enough to support our lifestyle (unless I get that Ferrari ;)). When we do decide to call it quits from regular salaried work, our tax picture will change substantially. Not only will our income tax change from salaried income to investment income, but our taxes owed will also vary depending on which province we live in. Let’s look at varying dividend income scenarios. Assuming that my wife and I split the income, what would our taxes look like in different provinces? Using an online tax calculator, I ran some numbers and this is what I came up with for taxes owing. Note that I’m assuming 2018 tax rates, no additional deductions besides the basic personal amount, and eligible dividends are our only income source. Running these numbers came with a number of surprises, namely the low taxation of dividends in the territories and New Brunswick, and also that Newfoundland charges so much more for dividend income on bigger non-registered portfolios. I also find it quite impressive that a couple can make up to $100k in dividend income and pay $0 in taxes in highly populated provinces like BC and Alberta. Dividend taxes start to pick up when approaching $120k in dividend income (between two people). However, to put things in context, $120k dividend income would require a $3.4M portfolio invested mostly in dividend stocks (assuming 3.5% yield). For aspiring investors looking at super early retirement (30’s and 40’s), their expenses are usually very low in the $30k-$45k/year range with dividend portfolio sizes in the range of $800k to $1.2M. 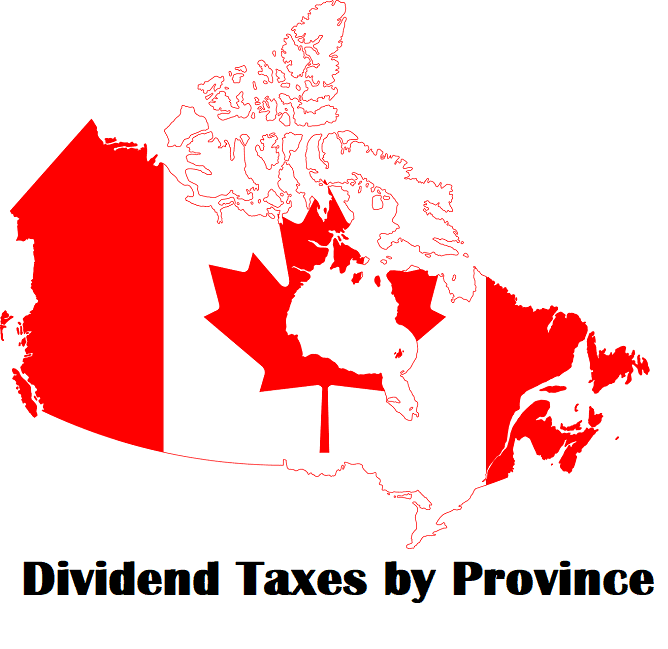 Living in any province with $30-$45k taxable dividend income would result in very little tax payable – if any at all! As previously mentioned, looking forward 10 years or so, I imagine that our financial picture will be different than today. We recently hit $43k in dividend income, which is steadily approaching our $60k goal in a couple years. Once that goal is reached, it’s possible that in 10 years, our dividend income could approach $100k. At that level, considering weather, lifestyle, and family, it looks like Ontario and BC are attractive options. In the grand scheme of things, there are very few early retirees in their 30’s and 40’s and even fewer who retire on solely dividend income. It is much more likely that there will be multiple sources of income with different taxation levels. I imagine that people who achieve financial freedom at a young age continue to grow and work on projects – at least I know it will be for me. Having said that, it’s still fun to imagine kicking up your shoes, doing what you want, and paying very little tax. You had better be getting $100k in dividends if you’re considering B.C. — B(ring) C(ash). All the retirement hotspots (and Lower Mainland) are insanely priced and the rest of the province gets typical Canadian winter weather. Good point SST. Do you have any favourite foreign options? Unless you look in the Windsor-essex county area. The Florida on Canada. Home prices very reasonable compared to rest of southern Ontario. Is “dry” cold a good thing? Speaking as a Nigerian who moved to Canada recently and has lived in NL and AB, “dry cold” is a GREAT thing. Thanks for the perspective. I spent a winter in Ottawa and recall experiencing a different kind of cold than NL. I recall being told to make sure to cover my skin or else it will freeze! Great information as always, thanks! Any chance you’ll revisit your previous article on non-eligible dividend income? Specifically in light of the recent tax changes for TOSI? We created a corporation using family savings, my wife and I being the shareholders (49/51). Would like to split any dividends proportionately. We also live in NL, and we talk often about living somewhere else. With a primary school child it will likely happen later, if at all. If Oil doesn’t rebound in a couple of years, the debt of this province will be such a burden on the minority of tax payers, that leaving may become a more attractive option. Hi Bernie, I hear ya! I feel the same way about the coming debt burden and the inevitable rise in taxes. I’m in wait and see mode! Great article. It was nice to see our province (SK) in the running for the lowest taxes. But yes, the long winters are still a problem! I’m assuming that this table only works if your nest egg (which is producing the dividends) is entirely non-registered (not RRSPs or pension money) because otherwise you’d have to worry about withdrawal rules etc that comes with registered money? That is correct, it assumes either non-registered or TFSA dividend withdrawals. As you said, RRSP withdrawals are taxable as income. come to Ontario baby, buy a condo in downtown Toronto and call it a day. BC is beautiful and if you can make 100k on dividends income and not pay taxes living in a beautiful area i dont think there is a better choice. Good luck growing the passive income! Don’t forget its only Canadian dividends too as US div is considered as regular income and may likely screw up your above scenario. I ran this screen years ago for fun and BC is my first choice. Probably not Vancouver but within an hour or so from Kelowna. Better weather and less rain. Not to take away from your site but taxtips.ca is a fantastic site for our tax info. Good point D2cold. Are you also a dividend investor working towards early retirement? And yes, I agree with your taxtips.ca recommendation, use them all the time. Dividends not so much. I look for anything that has the best growth, including dividends. I just thought it was a neat exercise to try and make a “safe and diversified” portfolio of only Canadian dividend paying companies. Alberta and BC killed it. Ontario isn’t too bad but considering our targeted dividend income is around $50-70K, living in my second hometown Nova Scotia isn’t doing too bad in that range. Good summary. Thanks as always! Favourite foreign destination – Costa Rica. First class health care. Lived there over several months. FrugalTrader. Just wanted to give you the heads up that once you go over 40K + federal personal tax credit (of just over 10K) of actual dividend income (not grossed up) you would be subject to the AMT if the federal liability is nil. The cost of living in smaller town BC can be much cheaper than in the large centres, and in my experience, anywhere in southern BC sees much nicer weather than I experienced during my years in St. John’s. If it works for you, make the move; I doubt you’ll regret it. Hi DAvid! Good to hear from you, always nice to hear from readers who have been around for a while. I’ve heard that the weather in BC is among the nicest in Canada! Do you have any recommendations on towns/cities in BC that have great weather, but affordable? There are so many small towns up-island on Vancouver Island, or in the interior of BC, south of Kamloops, that narrowing it down becomes a challenge. It also depends how large a community you want to live in. Some that stand out to me include: Salmon Arm, Vernon, Osoyoos, Penticton, in the Okanagan Valley; Nelson, Creston, Kimberley in the Kootenays, and towns surrounding Nanaimo on Vancouver Island. The exact amount in five provinces is $51,477 per person. For a couple, if you live in Canada for most of your adult life and had been working and contributing to CPP, once you reached 65, you and your spouse can get up easily get $15k to $20k in OAS and CPP payments per year as a couple. That can be a healthy amount to add on top of your dividend income. How can you and your wife split the dividend income in your 30’s and 40’s – Does that assume both have to own 50% of the total investments under their name? At what age can a person start splitting income? Hi John, it really depends on how you set up your discount brokerage accounts. If they are joint non-registered accounts, then you can split the taxes, the key is that you keep it consistent year after year. Not necessarily “Bring Cash” if you opt for the smaller towns. Some nice areas in the Okanagon that are great- wine country! Do you know which town/cities in BC offer the best overall value (weather, cost of living, raising kids etc)? Sooke! It’s the perfect place to live. Lol, I’m betting most ppl don’t understand what ‘sooke’ means . :). We don’t live here for the weather thats for sure . Thanks for this article and the fresh perspective. Glad to see some of the provinces named here are our personal favorites too. The numbers don’t look too scary too. Low taxes dividends can help you live a comfortable retirement life and enjoy without worrying too much about the money or taxes. If you are worried about cold weather, just visit Germany. Very few days below -7° and moderate temperatures all over the year. Price to pay : 27% tax on dividends , all of them, from the first $ . It´s unbelievable , but the explanation why 95% of all FIRe Blogs come from the Americas. To be fair, healthcare and education is cheaper. Twenty seven percent on dividend income from the first dollar? Wow. Thanks FT, I will start following your site more closely. And I will certainly link to some of your work, and again, follow your journey to financial independence. I have submitted the follow information as well. What a great example you provide. It’s all quite simple stuff to build wealth at an incredible rate. Live well below your means (save), invest wisely, pay down debt (pay off debt). I recently left the fulltime job I loved (Tangerine Advisor and Trainer). I ‘semi-retired’. We have no mortgage, no car debts. But my portfolio is smallish, I will need to earn half a living. btw love the East Coast. I set up shop on PEI for 3 weeks in July. I was just there recently for another 10 days. All the best, I’ll be watching and adding my 2 cents. Thanks for the kind feedback Dale! I live in Northern Ontario where it’s inexpensive to live but the winter’s are too long…and I like winter. Still, the winters are much better than downtown Toronto where I lived for 20+ years. The wet and windy cold is terrible. Once my wife retires in another year we will head to warmer climates (Ecuador, Spain, Portugal) for a month at a time. I’m 59 and mostly retired dividend investor with $38,500 per year in income from high dividend ETF’s from BMO and iShares as well as bond ETF’s from Vanguard. Fantastic Marko! Do you have your dividend positions in a registered or non-registered account? If registered, do you plan on withdrawing from them to fund your early retirement? I have $410K in a cash account, $315K in a RRSP that will become a RIF in Jan 2019, $110 in a LIRA that became a RIF in Jan 2018 and $85K in my TFSA. I will live from the monthly dividends that are no longer in a DRIP – except for the TFSA. Marko would you mind sharing some of your wealth building strategies? Sure FT – I learned long ago to distinguish between needs and wants and not to fill my life with unnecessary material possessions and clutter. I have always lived well below my means and enjoyed the freedom having financial security brings. I spend my money on experiences, travel, outdoor gear and electronic devices that I use daily. Investing as much money as possible in first mutual funds and later switching to index ETF’s helped a lot. Now in retirement I have switched to 60% high dividend ETF’s (BMO covered calls ZWU/ZWC & ZDI/ZPR/ZDB and iShares XDIV & XDG) as well as 40% in Vanguard Bond ETF’s (VAB & VSC). This seems to be working out in terms of a bit less volatility and nice monthly dividend payments that are nominally taxed. The biggest benefit for me is not worrying about the market fluctuations. In the past I would have been worried about corrections but today even when I am up or down $5K in a day (that happens a lot these days) I don’t worry since my monthly dividends keep rolling in. Hi Marko, Congrats again on your financial success!